I picked out some paint color chips and I'll post them soon. I know the computer won't get the colors right, but you'll be able to get an idea. Now, I just have to decide between the colors and pin down a "painting date" with hubby. I can't wait! Thanks so much for your help. You're the best!! 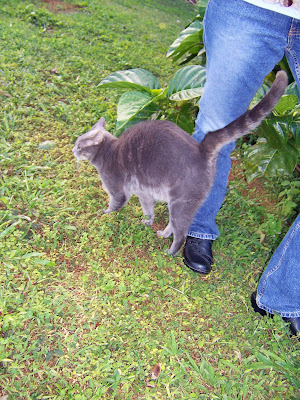 Its a beautiful day outside on Kauai today, but then again, most days look like this. Even in mid-winter. 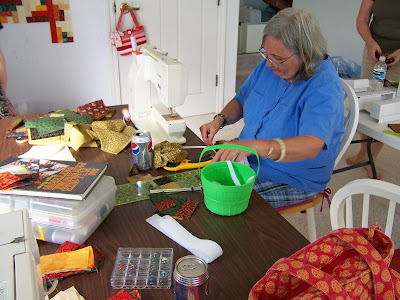 We don't have snow day excuses to stay inside and sew all day--we just have to do it anyway, in spite of the weather. Tough life, eh? We made Pink Penguin's fabulous baskets! My friends really liked the one I made from this tutorial, and they wanted to make some, too. I love how different they all came out. 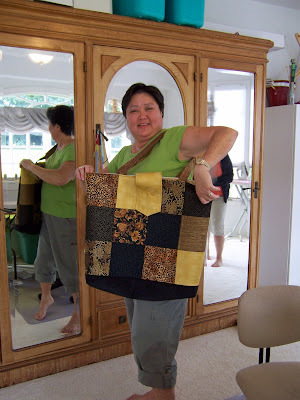 After Paige made her basket, she worked on her UFO--a half-square log cabin project that I taught at Kapaia Stitchery...what...a couple years, ago, Paige? But we're not keeping track. Ahem. Neat, huh? I love the colors...the turquoise really "pops" this one. Jo and Paige played with layouts on the design wall. I think they decided on this layout (I have NO idea what the layout "rule" was on this one...), so Paige needed to make more blocks. They're all so happy! 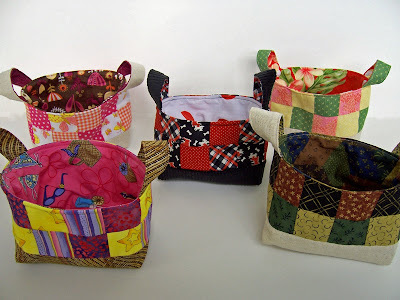 These are so adorable--you just HAVE to make one. Baskets by me, Roberta, Paige, Mary and Anne. She embiggened her basic basket plan and put handles and a flap on. Nice, huh? Her fabric selections are always so elegant. Is is a basket? A tote? A trash can? A feed bag? A pillow? I'll show you the finished project in my next post. 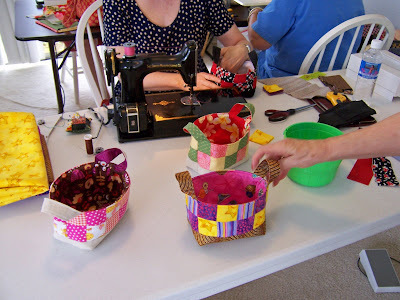 We all decided that we need to do more sewing this year. We let other activities get in the way of getting together--and that isn't good. 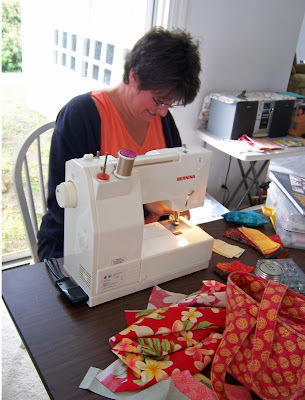 Our next sewing day will be in a couple of weeks...right, ladies? 2009 is the Year of Sewing, right? We promised. Sounds great to me. I love new paint! I'm getting bold with colors now. 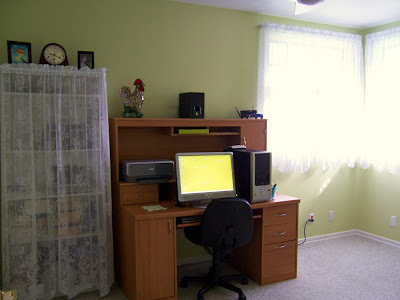 This is my computer room and the paint is called "Corn Husk" by Behr. I was terrified when we first started rolling it on because I was in a "mood" when I picked it out one Saturday. I went looking for a nice turquoise, but after looking at one too many turquoises, this funky green caught my eye. If you've noticed that my interiors are rather "spare," you're right. Kauai, although a lovely place to live, is full of red dirt, humidity, bugs, pooping geckoes, and sticky sea air when the surf is high. Our windows are open all year round because air conditioning is too expensive and we don't have heating in our homes. It is hell on furniture, draperies, and don't even talk to me about knick-knacks! Can you imagine having to wash every decorative item in your house at least once a month? So most everything is put away and kept off off the floor. 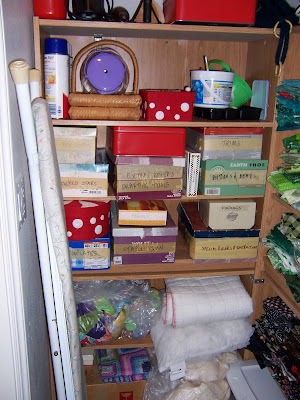 Clutter attracts bugs and more mold. Nice furniture fades in the sun and the veneers bubble and crack. The pulls, mirrors, and drawer hardware rust within a year's time. 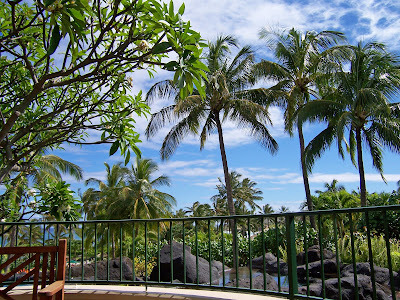 Hawaii is very hard on your stuff! Nice furniture is very expensive here. We don't have any chain furniture stores, and our department stores do not carry furniture. Shipping charges added to large items make them outrageously expensive, as you can imagine, and why pay for nice furniture that will look terrible in a year or so? It is for this reason that most of us furnish our houses with disposable furniture a la Wal Mart. I decorate for cool air flow to minimize bug-attracting clutter. The more minimal my interiors, the less cleaning I have to do, the less bugs build homes in my stuff, and the more the air can circulate and keep us cool. It took me several years of living here to give up on lush decorating styles--but now, I know what works. This is it. The sum total of my stash...and this is even too much! I'm working on reducing it. This closet is perfect for my stash. 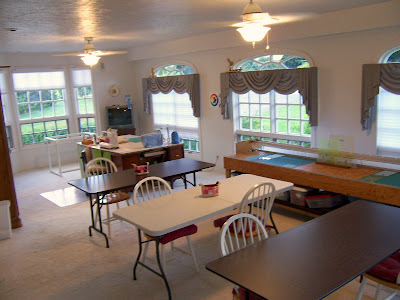 It's in my sewing room (shown below), but it's dark and I can open up the doors and let the air flow through on dry days. I have six fold-away tables, three of which are set up for tomorrow. We have lots of room and plenty of light. Windows open all around and overhead fans keep the air circulating on hot days. When I don't have guests, I store all those fold-away tables and have LOTS of floor space. 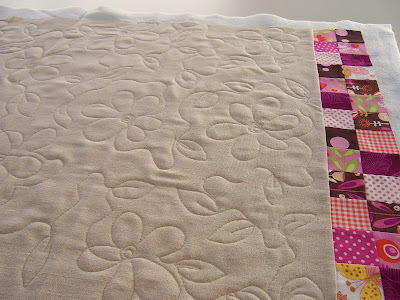 My homemade long-arm quilting machine acts as a cutting table for two mats with plenty of room to spare. 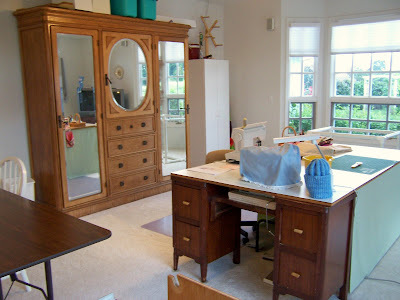 This is my sewing station. 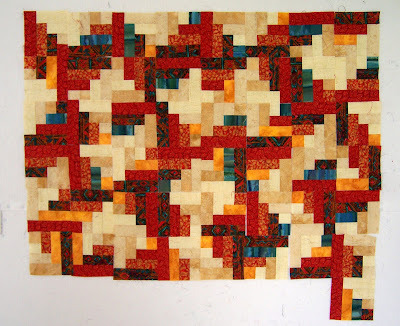 My Bernina is for quilting and my Pfaff is for piecing. 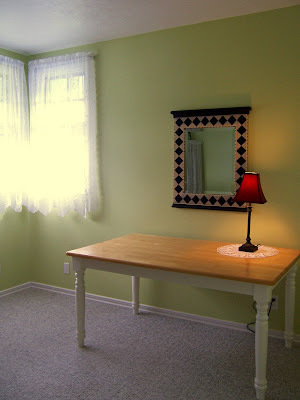 One of the reasons I'm showing you these pictures of my sewing room is that I'm about to give it a little face lift. These are "before" pictures. 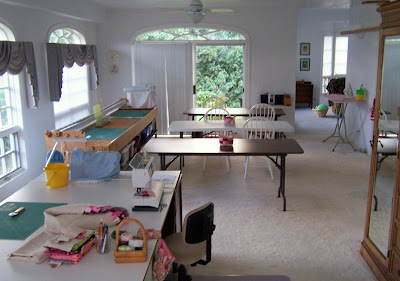 I've always considered my sewing room a "workroom" and never decorated in here. Can you believe those horrible morgue curtains (courtesy of the house's previous owners) are still up?? I've been gazing at those horrible curtains for TEN YEARS, people! Enough!! New curtains...or at least shades...are imminent. Okay...so here's where YOU, dear reader, come in. I need your opinion. What color would you paint this room? I'm going to leave all the trim white because I would have to spend five years painting those windows and baseboards and moldings. It takes me days just to clean all that woodwork!! So they stay white. The curtain question is a poser. Look at all that yardage it would take! Expensive fabric...or even colored curtains are out...they would fade within a year. So it's blinds, shutters, lace, or something...ugh. See why the morgue look has persisted? It's a problem. So there is a peek into my minimalist interior. As you can see, I am not a collector of "stuff." I get rid of everything I don't use very quickly. I am not overly fond of gifts (I know...gasp!!) because I only want a few things that I actually want and will use. Right now, my foyer is filled with my latest purge of stuff--ready to be hauled off to the thrift store (or perhaps I'll have a garage sale). I'm a hopeless non-collector--my house gets emptier of stuff every year! But it also gets easier to keep clean. More time for sewing! 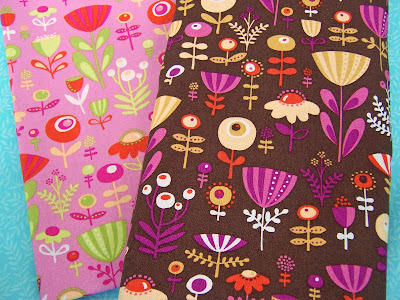 I'm in love with this fabric. It's so happy! It's also very Seventies, don't you think? My first inclination was to make an apron from it, but that's my first impulse with all the fabric I buy. 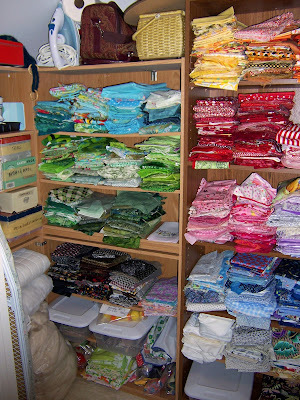 Aprons, tablecloths, or kitchen curtains. I wonder what that means? I LOVE THEM!! I can't stop playing with them. They're so fun to toss around. 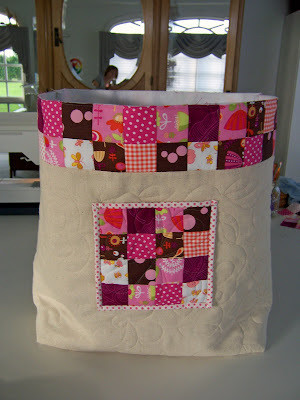 I found the tutorial on how to make them at a wonderful blog called, "Pink Penguin." 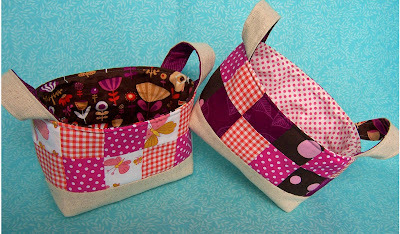 The link to the tutorial is here: Fabric Basket Tutorial by Pink Penguin She has some other great tutorials on her site, as well as some adorable things for sale on Etsy. Hello little soup! Are you stalking me? Are you wanting to come out for lunch? 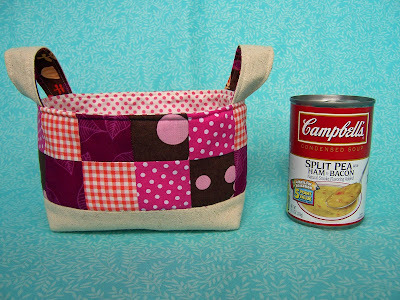 This basket would make an excellent two-can soup can holder. 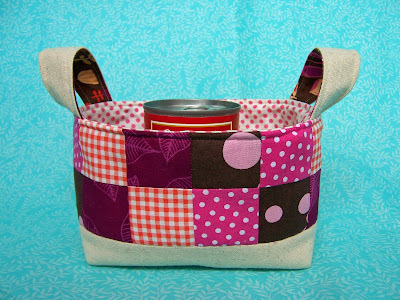 I'm not sure why you'd want to make fabric baskets for your soup cans, but hey...after thirty years of sewing, I'm running out of reasons to make little baskets. So soup today...maybe green bean cans tomorrow. Gotta sew. This is the pallette that's currently inspiring me. Two years ago, I NEVER would have paired pink and orange! And after living through the seventies, I didn't think I'd ever be attracted to that dark chocolate brown, either. And yet...here they are and I love them! I don't think I want to put this assortment away yet--perhaps I need to make another tote bag or something. Yeah...a grocery store soup tote. I don't have one of those. All my other totes are for other things, like crackers and tea. I don't have a tote for soup. Well, I know what I'll be doing today! This green colorway would make a good broccoli tote, yes? I need a broccoli tote. 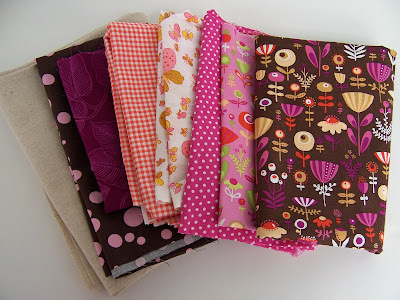 Funny how I keep ending up in the kitchen with my fabric choices. Maybe I'm just hungry. are u gonna update your poor bloggy? I can't stop giggling. Yes..."lorrwill"...I have been neglecting my poor, poor bloggy something awful, haven't I? Thanks to all of you who have sent emails of concern. And thanks to "lorwill" for making me laugh and making me finally post something! I'm doing fine, and I think I'll be explaining my absence a bit if you stay with me and be patient. I can't blog every day like I used to, but perhaps I can tell you what's been going on in my life. But first, I have to show you what I finished today!! 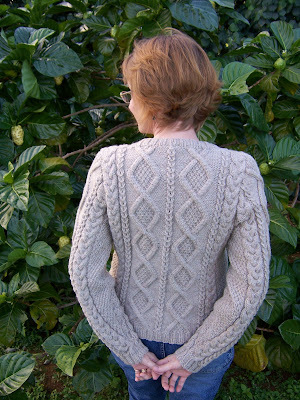 My first sweater!! 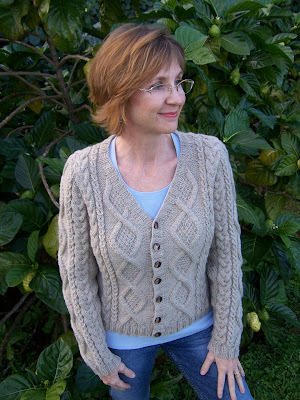 This is the "Must Have Cardigan." It's from a Patons booklet called "Street Smart." 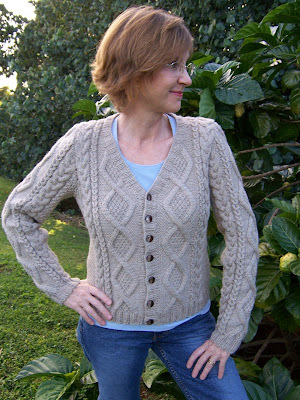 The yarn is Patons Classic Wool Merino. 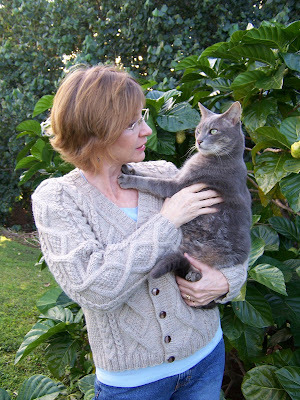 Yes, I said WOOL sweater. In Hawaii. Okay, I'll wait until you stop laughing. I love the cables that go down the arms. 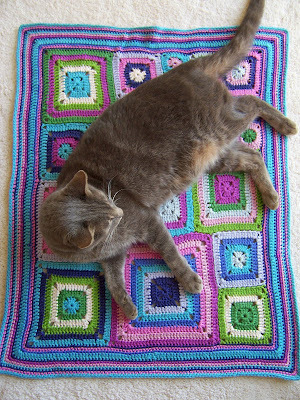 You can find the specs on Ravelry--I followed the instructions exactly, right down to the color and type of yarn. I made a medium and it fits me perfectly! It was quite a coincidence that I happened to finish it completely on the coldest day EVER in our backyard. The temperature gauge read 51 degrees and boy, is my husband ever playing it up. He's got fleece-lined jeans on, a black fleece jacket, fur lined slippers, wool socks, and a watch cap. Me? I think the cold feels good. It must be menopause. 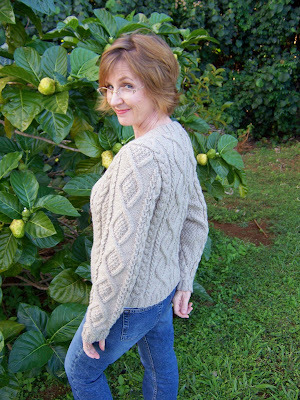 A sassy pose in my cozy sweater. 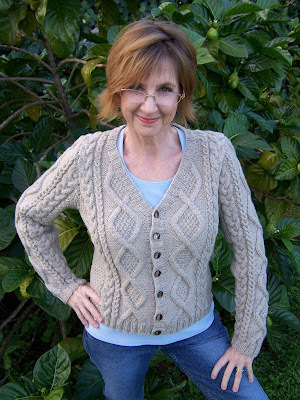 My FIRST sweater...EVER. I'm very proud I finished this! Well...you knew this was gonna happen.